For years it has been debated whether or not professional gaming is considered a sport. A lot of people believe that sitting behind a screen with a controller or keyboard competing in a game is not a sport, but in reality, it can be. Being a professional gamer is difficult. Like most sports teams they too have to practice, work as a team, and compete. But what makes it difficult is that unlike sports where to win or lose you make money, in professional gaming you have to be at the top to make a more money. Esports is a form of organized, multiplayer video game competitions, particularly between professional players. They will set tournaments up for many games and have some of the best teams from all over the world compete. Esports is constantly growing and getting bigger. This year marketing researcher is predicting 2018 revenues to hit $905 million, a staggering 38% increase from 2017’s $655 million. They gain their money through tournament fees and sponsors. With the rate this is growing Esports will be a billion dollar company. With major growth coming, more and more professional gamers play to compete to be the best in the world. Just like football or basketball, professional gaming also has teams competing to be the best. But could professional gaming really be counted as a sport? Even though Esports has an extremely large fan base, a lot of people still disagree. The United States government only gave Esports one P-1 visas which is what recognizes the teams for a game called “League of Legends” as athletes, but not the rest. How can it be considered a sport? Sport is defined as “an activity involving physical exertion and skill in which an individual or team competes against another or others for entertainment.” So how can sitting in front of this screen playing a video game be considered a sport when there’s not much physical activity involved. Most people believe most gamers are out of shape people but quite a lot actually stay fit. A lot of them go to gyms to stay in good health. Professional gamers need to stay healthy and in good condition if they want to compete like other players in sports. In my opinion, Professional gaming is a sport. These players work hard to do their best to win. They practice, compete, work on teams just like other sports. 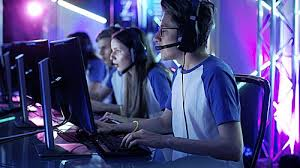 So while most professional gamers are not considered an athlete or gaming being a sport, with the ever-growing number of fans, it will be soon. The name says it all. I believe e-sports is a sport. There is some sort of physical activity involved and most of all, mental focus is really required. I play games like Onmyoji arena, Arena of Valor, Mobile legends, and other e-sports games. The hand movement is insane and tiring and that counts as a physical activity in its own way. Some of the professional e-sports players spend 4-7 hours per day practicing. They do really put in a lot of work. I might even join one of the best e-sport team in the world one day, Cloud 9. Good job on the article Bryant. Wow! Great article! It had so much great information and I learned a lot just by reading this. Very cool article! I really enjoyed reading it. I am not a gamer myself but I know that those people put a lot of time and effort into doing what they love. Great job and keep up the great work! You bring up a great point whether gaming should be considered a sport or not. I’m not really sure what my stance on the controversy is, but I think more people should take gaming more seriously. Great article. I don’t know a lot about gaming but all the younger kids in my family do it and they do tend to have great focus. So I don’t know what side I’m on. But great job. I agree with you. It should be considered a sport since there’s a team, they practice, they compete and does as much as other sports. Very well written article. I agree that Esports are a type of sport. They are competing in team competitions just like other sports. Great job on your article! Maybe it is time for the definition of a sport to evolve. Everything is evolving and if sports evolve, it could open up many creative and fun activities. Keep up the great work Bryant! I also agree with the fact that gaming is a sporting event because they put in the same amount of time, effort, practice and commitment as any other sport does. I liked all the information you found to back up the idea that gaming is a sport. Are athletes paid too much?